Virgin Tourist Destinations: Albania and Kosovo – Traveling Epic! The past is still very close to the surface here. The sidewalks are still a bit raw/rough, and you do have to watch your step so you don’t fall in a hole. It’s a different standard. They’ve had some tough economic times over the past few decades or more. Lots of history from World War 1, 2, and the Bosnian Conflicts, and horrible genocides that I’m still trying to get my head around from the Serbo-Albanian conflicts that happen in their backyard with their brothers in Kosovo. Religious/Cultural turns to political conflict. Believe me when I say it’s not all religious conflict. It’s not that simple. There is still a lot of poverty, and a lot of what you would expect in a country that has been ignored for decades and dismissed as a place to invest. So, we head to the coast. Durres is an up and coming hub. Paul, Michael and I are talking about how this coastal city is going to transform over the next decade. Money will come in, investors will see this town change from a port town to a cruise hub, and the tourists will come in droves. The high street is already getting ready. The condos are coming up, the actual docks are being built to support it. This town is seriously going to transform. If you want to see what it looks like before tourists… you gotta go now! The town can support you now. There are hotels, the restaurants, they have fabulous seafood. 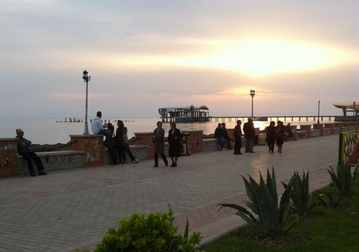 When asking what kind of local food they had there in Durres we were told… Italian food. What a lovely afternoon and evening in Durres walking around Roman Ruins and castle tower, as well as a sharp shooter BB shootout (yes, I won round 1 with the hand gun, and both Paul and Michael did a great show on the rifle). We had a great walk around town and really felt like this place had big hopes. I think the people see good times coming. We almost had Paul convinced he should buy a condo on the water. The night out in Tirana after we got back from our stint. There apparently is a narrow gauge train between the two towns, but not until our ride back did we find out that it wasn’t shut down, our taxi driver had convinced himself it wasn’t for us. I was pretty upset that we had missed out on seeing the real local route between the cities. The roads were in great condition, and I’m sure that’s what he wanted us to see. I think we paid 60 Euros for the round trip including him waiting for us 3 hours in Durres for our amazing seafood dinner. So glad we did it. 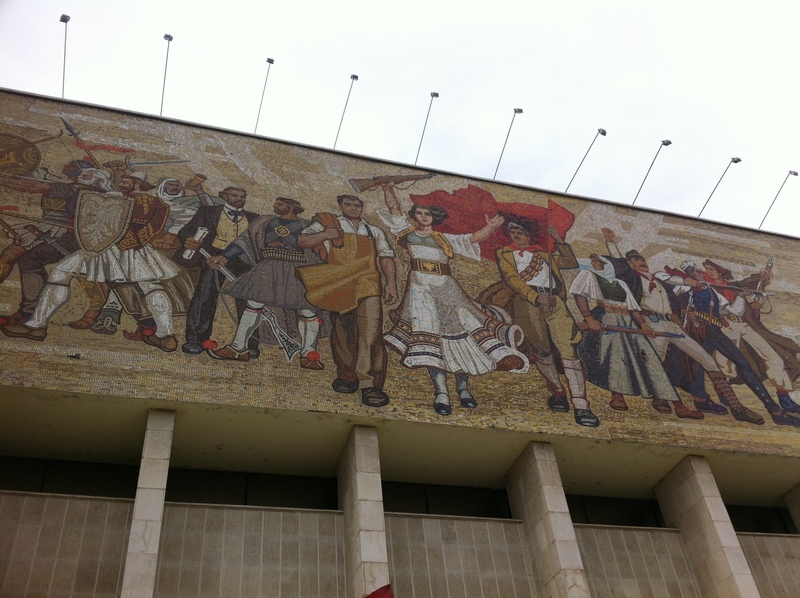 Walking around Tirana, none of us felt threatened and the young population really came out. It was great to see a really nice vibe in this city. There are some rough and depressed buildings. In fact one of the things to see in this city is those massive communist housing, but instead of dark and gray, they have been painted in colorful ways. 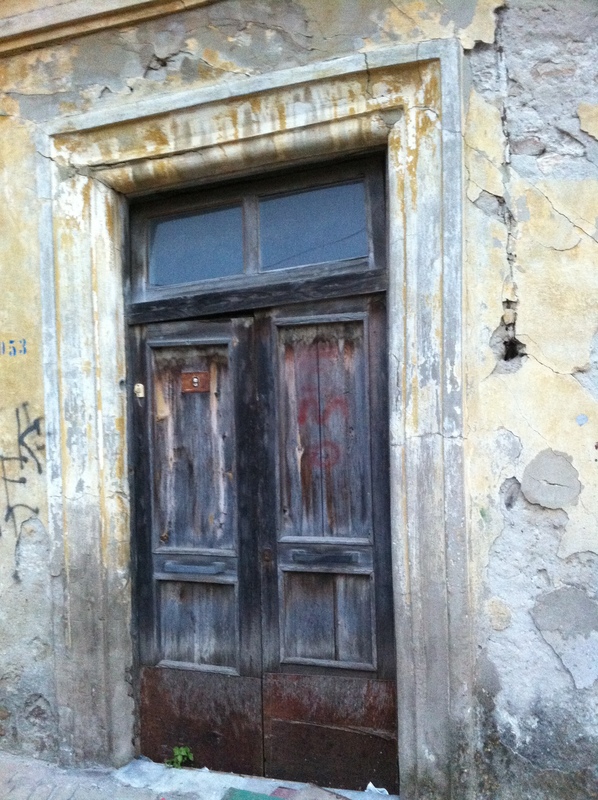 In our walking around we had the opportunity to get close to one of those buildings and I saw the door was open. I dared Michael to go to the top. It was enough for all of us to take a tour of the communist style housing. Incredible doors. I need to take the opportunity next time to not just go into the stairwells, but go into the housing itself. While some may think it is like Detroit, it was so NOT Detroit government projects. The people really had pride in their housing. 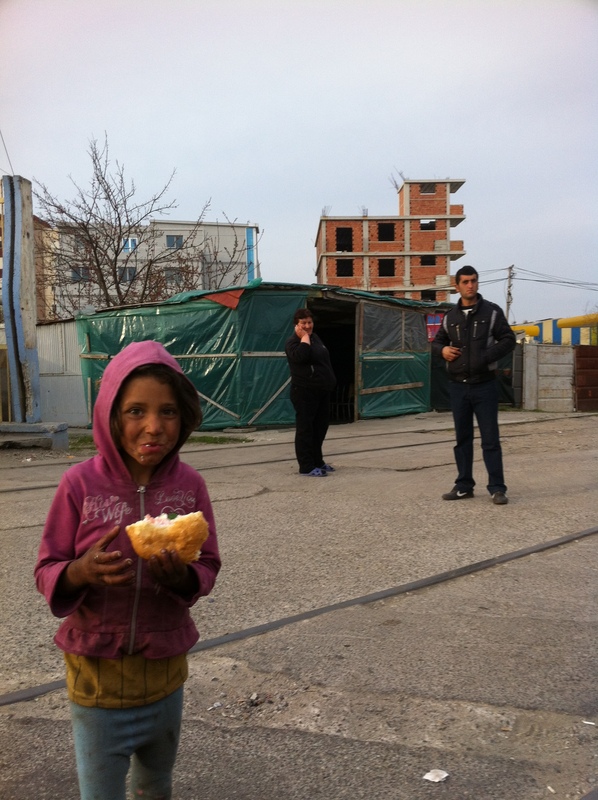 Driving to Pristina, Kosovo the next morning was something I had no idea what to expect. I hadn’t done any research. I like doing the “No reservations” style of travel. I like being surprised. I know that’s not for everyone. I find most of what makes it to America is out of date, and carries fear. Our world is an amazing place and there are very few places in this world I wouldn’t go. I won’t get into how different Nicaragua was between research and reality. Much of the world that has a bad rap doesn’t reflect reality. On the list of Dangerous border crossings in this world, I’ve been through more than half of them. What a beautiful part of the world. 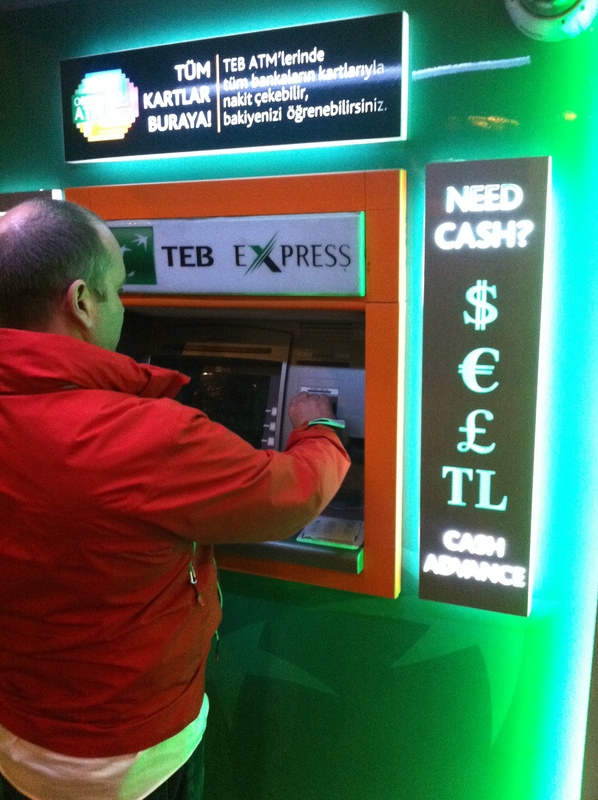 Our taxi driver collected about 100 Euros from Tirana to Pristina. He wasn’t worried at all. Amazing mountain drive, beautiful landscapes. We had made contact with an IT guy in Pristina that we were keeping in touch with. Betim would immediately gain our trust and be an awesome host. First thing I noticed on our drive was all the US Flags. It wasn’t unusual even to see a US flag flying higher than the local flags which I haven’t seen anywhere in the world. 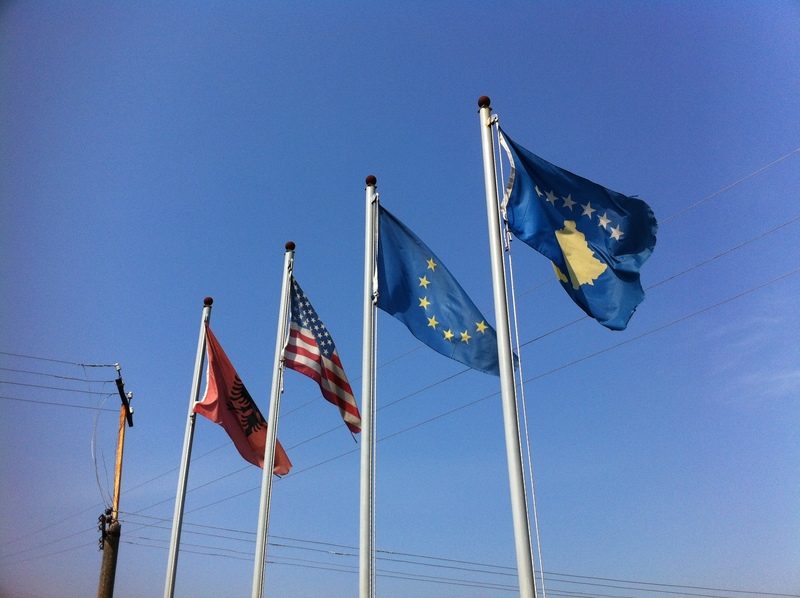 This set of flags was outside a gas station just past the airport in Tirana still in Albania, but includes the EU flag and Kosovo flag. Kosovo is independent. To the north, NATO keeps the peace and holds the border that was established in 1999. Kosovo is not yet sovereign, not yet considered a country by the UN. There’s a line to the north that’s yet to be resolved. It’s been held since 1999, and the hope from both sides is that this can be resolved peacefully. Kosovo identifies with Albania, and the serbian people with Serbia. Hence the confusion and concern. We visited a Serb village outside of Pristina. The people in the town speak a different language than the Kosovars which speak Albanian. Someone might think that war rages on. This is not the case. While we did see some military vehicles from time to time, there is peace, and people live their lives. Our friend Betim has not served in any military and brought together a small technical community. We were pleasantly surprised with meeting. Was so awesome to gather with the technical folks there in Kosovo. We really weren’t expecting to meet anyone, so it was really awesome when we met some really influential technical folks across a variety of technologies. I don’t pretend to know the full story, even the Wikipedia article on Kosovo War I used this article to do some of my research, but even that particular articles changes and is not as as impartial. Betim prior to the meetup with the technical folks he took us to Gadime caves, marble caves that extend over 1KM, but aren’t fully excavated yet. Wow, and what a cave it was. In variety this cave had about all of the different manifestations, as well as some very usual ones. I’ve been in a lot of caves in my life, and this was quite impressive. The Romeo & Juliet column that is 2 millimeters from connecting is extremely impressive. There are some great images if you’re into caves. It really is a treasure. After the tour, we went back to the square, got some great photos local drinks and an encounter with local celebrity… one of the mayors. I was interested to see a Statue of Liberty, more US flags, and mention of a George Bush and Bill Clinton streets and even a 13 foot Bill Clinton statue. Yes, the ethnic Albanians really love America. I was impressed with our meeting of the locals. They all spoke english just fine. The technology that is our specialty was in use and this was encouraging and impressive. We had some incredibly engaging conversations. Betim has quite the skill at creating conversation and stirring up a debate. He’s also a great ambassador. I was telling him he’ll likely end up in politics, but he doesn’t agree. I’ll definitely be watching his career. In fact I hope to share some design ideas and seeing what we can build together. He has done some outsourcing, and has some great resources. Always a good find and to have such intelligent resources in an area that is close to central Europe can be of great benefit. I think this bread basket is holding back. What an incredible meal. The vegetables were an explosion of goodness. I grew up in the country and ate vegetables out of our garden and the vegetables didn’t get close to what we tasted. I’m serious, I think vegetables are ok, and I eat them, but wow. We made a meal out of the vegetables and were ready to toss the meat. Not to say it wasn’t good, it just wasn’t Kalbi beef and the veggies nearly had us ready for that. The lamb was really really good though, and we were suggesting it may have been better than the lamb we had in Chile. The veggies though, I still can’t get out of my mind. In fact, this was the case across the various meals we’d have over the next week. Albania had awesome veggies, Kosovo as well, and Macedonia… After an incredible evening and great hotel in Pristina… (Oh by the way, the hotels in Pristina are great, and the city didn’t have that many holes in the streets. It actually looks like a great city. Much more modern and setup for tourists and foreigners than Tirana or Durres. I’m told from others it’s foreign money that has come in… Get outside the city and the small villages take you back a couple of decades. That is definitely the case. Much of eastern Europe outside the big cities in general are tough to travel through for most tourists, but I enjoy the challenge. Language for us never really became much of an issue, but most of conversation was with hotel staff, restaurants, and taxi drivers. Someone told me they had a hard time ordering in Durres, but this was not the case for us. Joel, thank you for your kind words and for your time to blog about our meeting and your stay in Kosovo/Albania. Your are very welcome again! All the best from Kosovo/Albania. Wow, what a blog! Joel you’re great man! I hope I contributed a little for your wonderful trip in my country. It was really short time from announcement to the coming and short time of staying also, this put me in a hard position to do even more. I wish you great time! Betim, you were an awesome guide, and really helped us learn so much about the culture and where politically incorrect you were still interested in helping us understand your perspective. Hope to get you more involved! Pingback: 10 Tips to Preparing for Epic Travel | Traveling Epic – the way to travel! Durres to Pristina is about 3-4 hours depending on stops by car with the new motorway. Why dont u just fly from London – it hell of a lot cheaper. Joel, what an interesting read on the Balkans! My husband and I are currently in Croatia, contemplating heading to Albania. 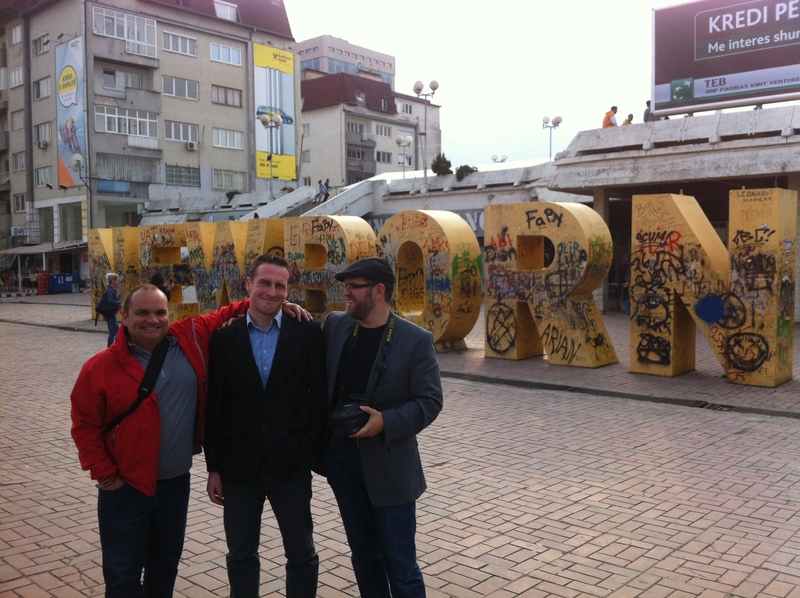 Having been to Kosovo about 10 years ago, I was really interested to learn how it is today. Were you able to get a consistent internet connection in Albania? Yes, we had wifi at our hotel and at lunch.